Chocolate Peanut Butter Blondies are a rich decadent dessert perfect for peanut butter lovers. 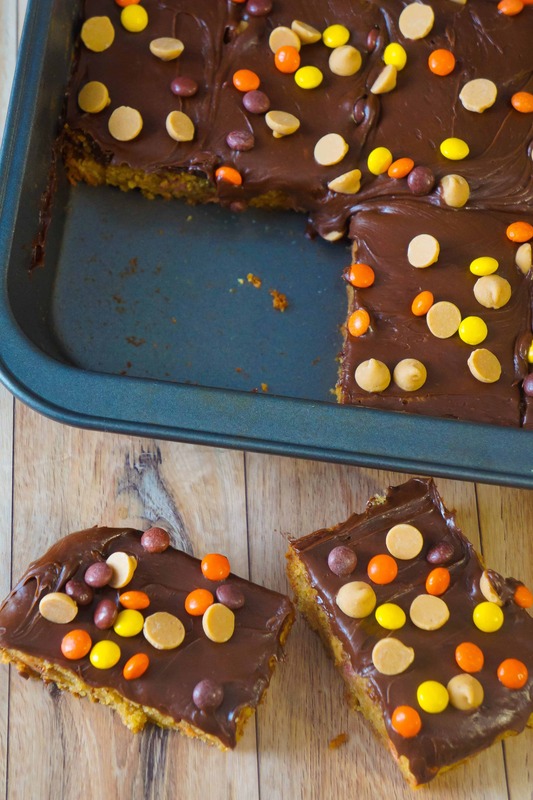 Learn how to make these peanut butter blondies with milk chocolate frosting and Reese’s pieces candies. 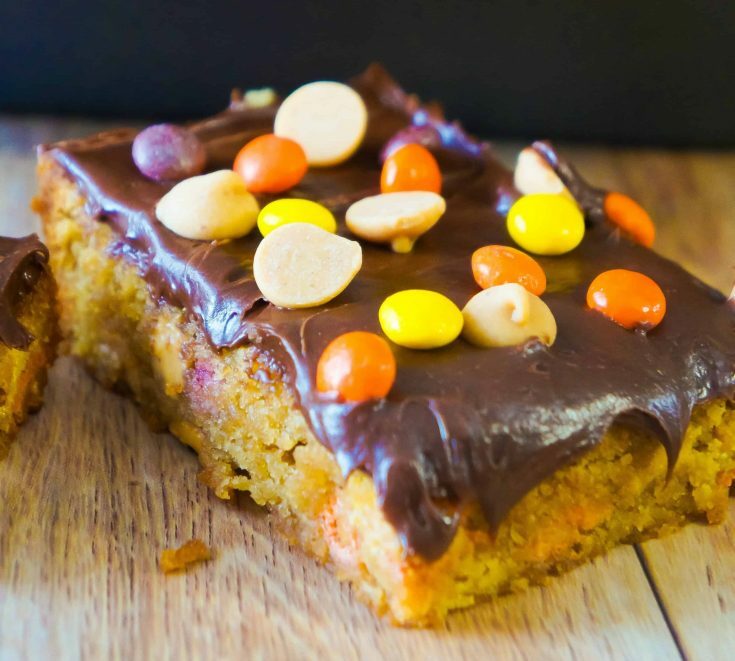 These easy peanut butter bars are loaded with mini Reese’s Pieces candies and Reese’s peanut butter chipits. I actually prefer blondies over brownies and I love all things chocolate and peanut butter so I decided that chocolate peanut butter blondies would be the perfect recipe to experiment with. To make these peanut butter blondies I started by stirring together some golden brown sugar, melted butter, eggs, vanilla and salt. Once everything was well combined I stirred in some smooth peanut butter followed by some flour and baking powder. 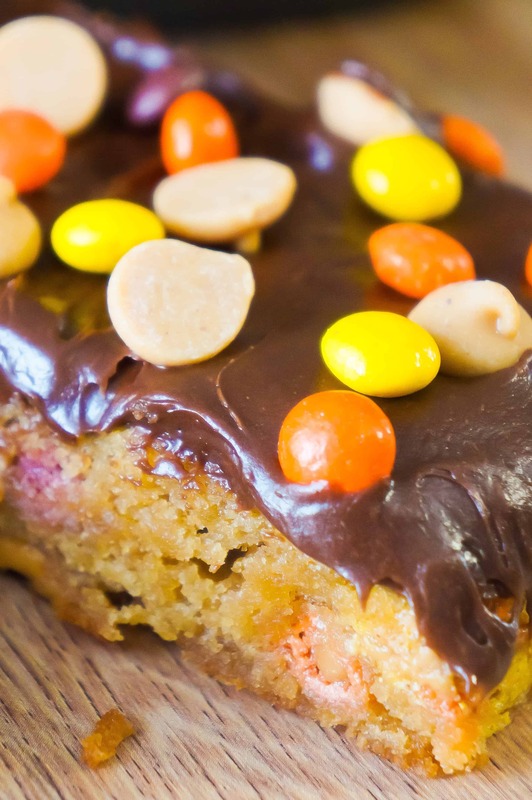 When the batter was nice and smooth I added in the mini Reese’s Pieces and peanut butter chipits. I poured the mixture into a greased 9 x 13 inch cake pan and spread it out evenly. I greased my pan with Pam Spray For Baking . I use this cooking spray for pretty much everything because I find it way less greasy than other sprays and also very effective. I’ve never had trouble removing anything from a pan when using this spray. I baked the blondies until a toothpick inserted in the center came up with just a few crumbs. Then I allowed the blondies to cool completely before topping them with chocolate frosting. 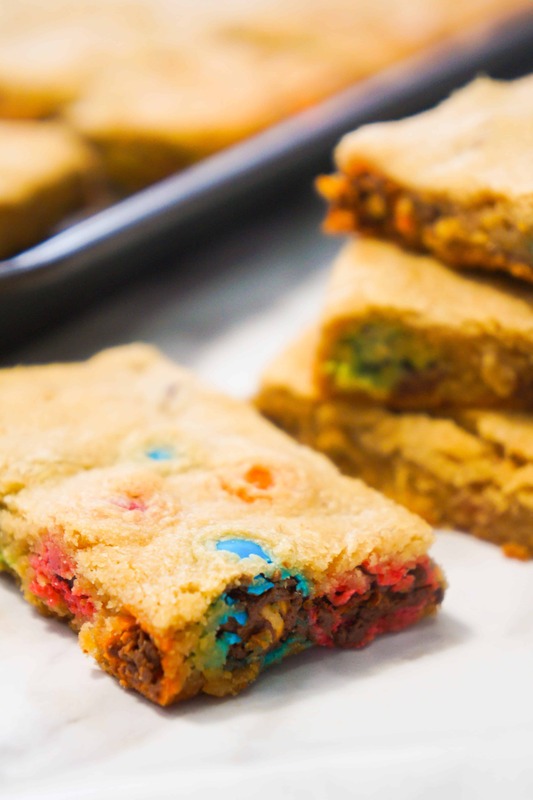 If you try to apply the frosting before the blondies have cooled it will just melt and make a huge mess. After adding the frosting I sprinkled some more mini Reese’s Pieces and Reese’s peanut butter chipits on top of the bars. I cut my blondies into 16 large rectangles but you could also cut them into 24 smaller squares. 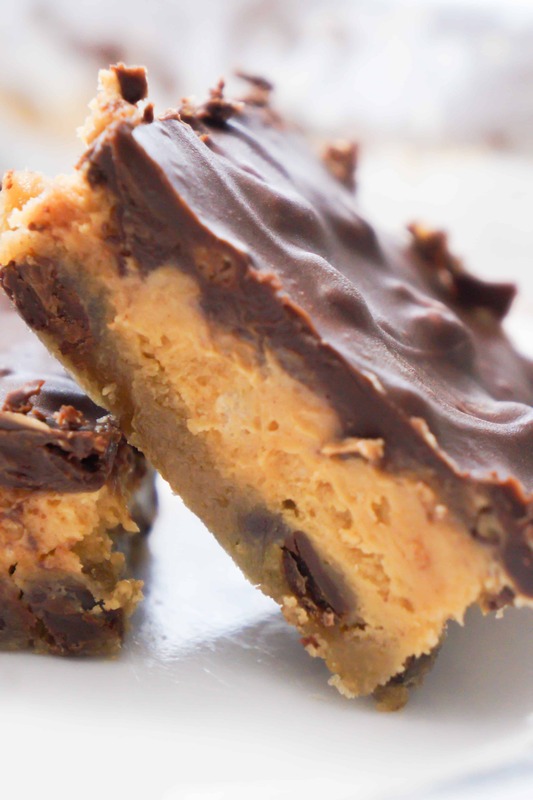 These delicious chocolate peanut butter bars are the ultimate dessert for peanut butter lovers. Be sure to try out this Chocolate Peanut Butter Blondie recipe the next time you are in need of an easy dessert that is sure to impress. Another delicious chocolate peanut butter dessert! 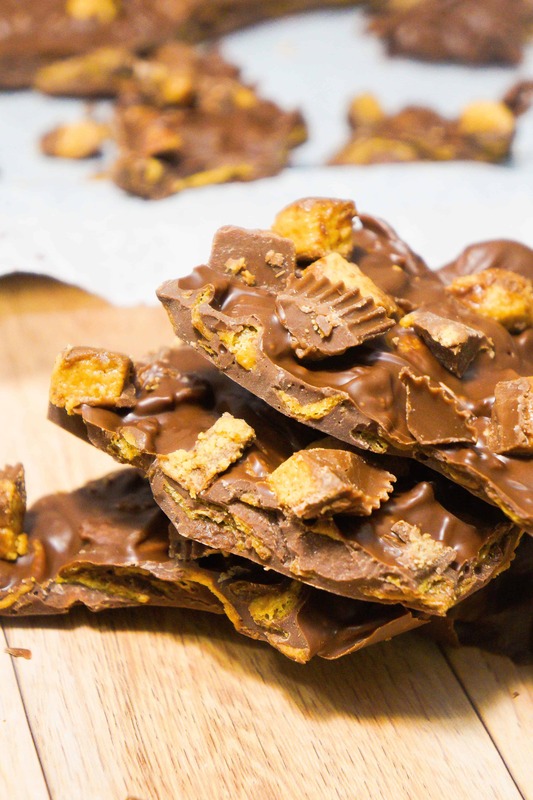 Check out Fritos Peanut Butter Cup Bark. 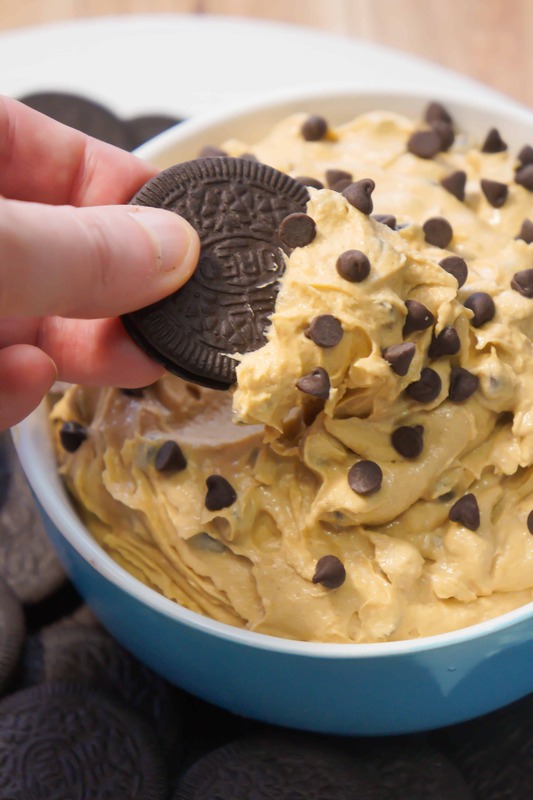 If you are looking for more easy dessert recipes check out Reese’s Pieces Cream Cheese Brownies, Caramel Chocolate Cream Cheese Stuffed Cookies, Easy Peanut Butter Bars, Cookies and Cream Red Velvet Cookie Bars, Chocolate Chip Cookie Dough Pie and Peanut Butter Cookie Bars. Chocolate Peanut Butter Blondies are a decadent chocolate peanut butter dessert. 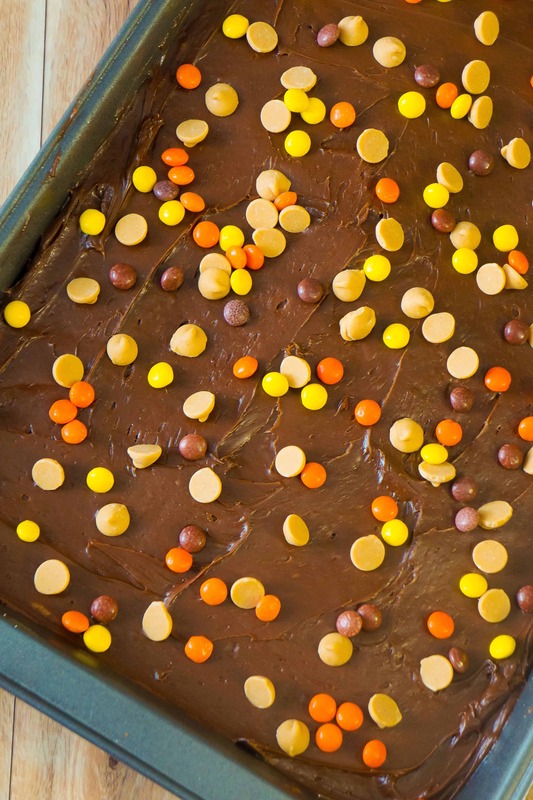 These peanut butter brownies are loaded with mini Reese's Pieces and peanut butter chipits. In a large mixing bowl stir together brown sugar, melted butter, eggs, vanilla and salt. Once mixture is fully combined stir in peanut butter. Add flour and baking powder and stir until batter is smooth. Stir in 1/2 cup each of mini Reese's Pieces and peanut butter chipits. Pour the batter into a greased 9 x 13 inch cake pan and spread it out evenly. Bake for 26-29 minutes until toothpick inserted in the center comes out up with just a few crumbs. 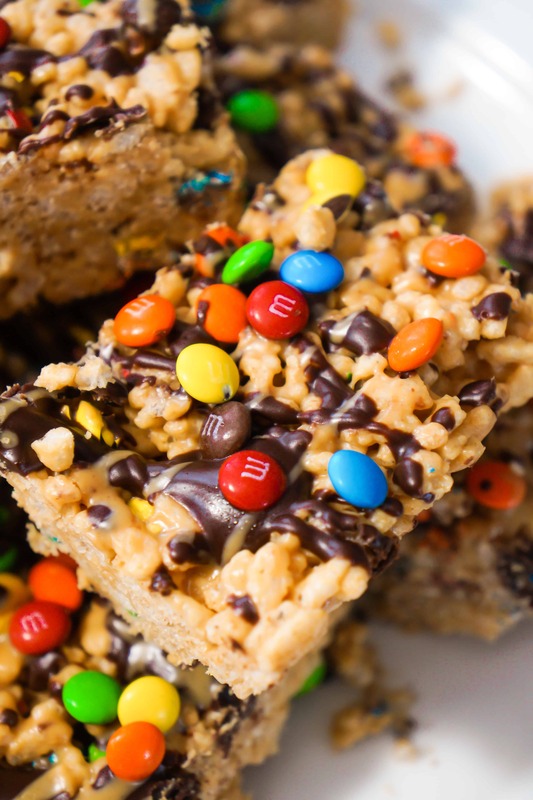 Allow the blondies to cool before spreading on the frosting. If you try to apply the frosting while the blondies are still hot it will just melt and make a mess. 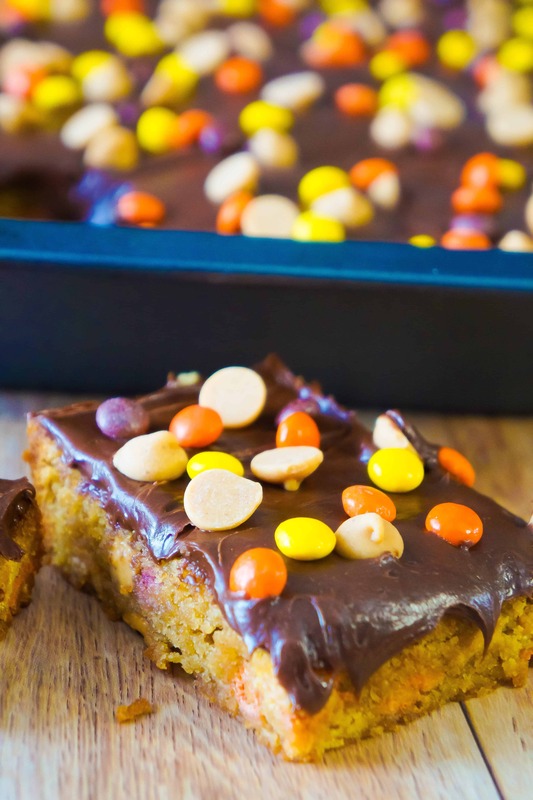 Once the frosting is spread evenly over the blondies, sprinkle on 1/4 cup each of mini Reese's Pieces and peanut butter chipits. Slice and serve the blondies. If you would like large pieces you can cut them into 16 rectangle or for smaller servings do 24 squares. I bake for the kiddos at church every Sunday. I love to make bars for them because it is so easy for me, and they love them 🙂 These blondies look amazing. I have to make 3 9×13 pans to have enough for everyone. I will for sure be doing these soon. Thank you so much for posting this recipe.